Mykonos Island was not just my first taste of the island itself, but it was also my first real taste of Greece. 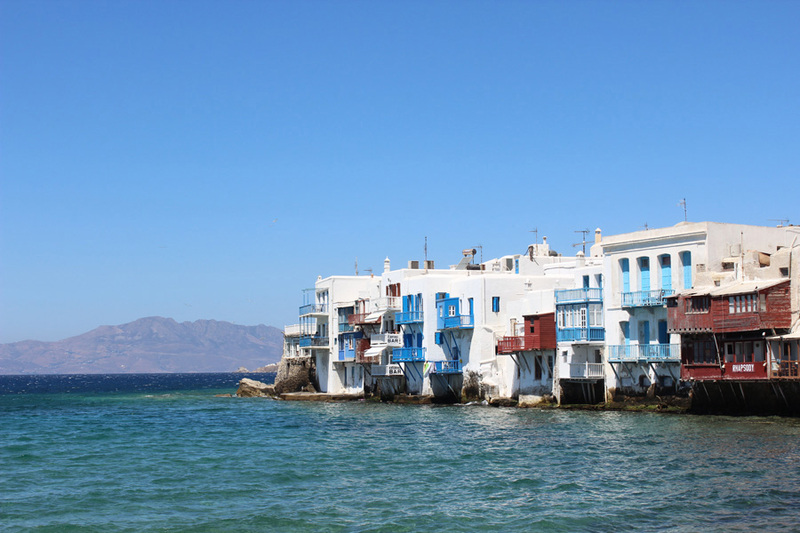 After spending 1 evening in Athens the night before due to my plane’s late arrival, and departing at the crack of dawn the next day for the ferry, I was looking forward to Mykonos as a taster of what was to come from my Greek island odyssey. There is a local law in Mykonos that all the buildings have to be painted white. If you choose to paint your building another colour then you have to pay a really high rate of tax so most people just opt for the white. You may notice on many of the other islands that many of the buildings are white too, but it is only Mykonos which has this as the law. At first it seemed bizarre that they would make such a rule on the island, but in actual fact the main town in Mykonos was actually one of the most pretty I’ve seen. It was really quite beautiful, and definitely the highlight of the island. Mykonos is also known for having some of the craziest drivers. I was here as a part of a flexi-tour, i.e. you come with a tour group but have the freedom to do your own thing a lot of the time. Our guide had warned us that if we wanted to rent a scooter we should not do it on this island. Any other island is fine, but not Mykonos. 2 days later as one of our group was nearly thrown off her bike and down a hill by some crazy drivers behind her speeding and nearly knocking her off, we soon learned why our guide had warned us. Mykonos drivers are a crazy bunch! Of the 4 main islands that I visited on this trip – Mykonos, Paros, Santorini, and Ios – Mykonos was by far the most expensive. This was across the board for accommodation, eating out, drinking out, etc. I spent 4 days in Mykonos, but in hindsight had I known how expensive it could be I would have only spent 2 days on the island, and spent the remainder in somewhere like Ios which is a lot cheaper. That said, I had some really nice cocktails on the island on one of my few nights out there. They were expensive at €10 for 1, but they were huge and did taste yummy! Please Never Stay At ‘Paradise’ Resort! I touched upon Mykonos being expensive in the previous post, but one of the reasons why my stay turned out to be so extortionate was because I stayed at Paradise Resort while I was there. It was the drop off point for my tour, which is why I booked without further investigation beforehand, but it is honestly the biggest rip-off I have ever come across while travelling. To stay in a squalid, heat-box, style hut, sharing with other people it cost me €25 a night. The bathroom facilities were utterly disgusting, with grime all up the walls, and they really stunk badly. I seen the cleaners come in and do not very much before leaving as though they were finished. They also don’t change the beds when a new person comes in unless you ask them. Surely that should be something the Resort is on top of themselves without guests having to push them to put a clean sheet on the bed when they’ve just checked in? Aside form that a small beer at the bar was €5 (WITH the tour discount that we were given), and they also charged you €12 for sun loungers. Wifi was €2 for 30 minutes, and was so slow it was un-usable. They refused to give me a refund despite the fact I was unable to even check emails with the wifi they provided me. That’s not to mention their in-house club costs €30 for entry, and is €10 a drink once you’re inside. Also the ‘restaurant’ they have inside seemed ok value at first until you realised it was just re-heated meals they had left out the whole day. To top it off we were way out of town, and if you had just booked somewhere in the town centre you would have got things a lot cheaper and been better located for everything! They only good thing was the close proximity to the beach. – My first two days in Mykonos, if you’d been reading my social media updates, I probably wasn’t too positive in what I was saying about Mykonos. In actual fact, Mykonos is a really pretty island. It’s definitely worth a day or two’s visit. I’m glad I was there 4 days in the end because it allowed me to see that it was my accommodation that was souring my image of the island a little bit, not the island or the people who live there. I would definitely recommend a day trip to Mykonos sometime if you’re going to the Greek islands, but I would highly recommend that you don’t stay at Paradise Resort! – If you enjoyed this article you may also want to read about the top 5 sights in Santorini. I want to go to Mykonos now! Thanks for the heads up about Paradise Resort too! As lovely as Mykonos is I also found it to be very expensive especially when you are on a shoestring traveler’s budget. Other than that though it does have some lovely places to visit.